Аppreciate it for helping out, superЬ infο. “Our individual lives cannot, generally, be works of art unless the social order is also.” by Charles Horton Cooley. Thanks, Lorrine. We appreciate your support. Do spread the info from here or our Facebook page. This is useful; I’ve heard too many comments about Mr. Corbyn’s anti-Semitism. Of course it’s a slur, but a powerful one. Glad to know it’s being countered. Thanks, Miriam. We appreciate your support. Do spread the info from here or our Facebook page. Thank you Tony for this comprehensive response to the toe licking Pollard and his ilk. You have truly covered the subject forensically. Interesting how delighted they were with the Tory victory in the election and how dismissive they were of Miliband in spite of his origins. The Tory love-in with the real anti Semites is, in true Stalinist fashion, brushed out of the picture. Dianna, It was quite by chance I stumbled on Pollard going hell for leather as he tried to exonerate Kaminski of the charges of anti-Semitism. It staggered me that he saw nothing wrong in Polish Jews being asked to apologise in return for an apology over the foul murder of over 300 of them in Jedwabne. As if the loss of 90% of Polish Jews to the holocaust was not enough. But then, as Pollard said, you can’t accuse Kaminski of anti-Semitism because he is so pro-Israel! Great! I have been wanting to join a collective voice in support of Jeremy Corbyn’s policies and his life as an anti-racist activist, and against the smears of antisemitism — how do I know who has received this already, so that I know how to pass the page on to other friends who may not have seen it yet? When we get a certain number of names should we write again to the JC, the letters page of the Evening Standard, Guardian, Independent and Observer (countering Nick Cohen’s misguided efforts)? Thanks, Amanda, please just share the url through your networks. There have already been letters in the press and we will focus now on sharing our statement, getting voters out and encouraging people to volunteer to help the Jeremy for Labour Leader campaign. There’s information on the “Articles on this site” page about how to volunteer (click on the link at the top right-hand-side of this page). Well done guys all the best in the future. Thanks, Damian. We appreciate your support. Do spread the info from here or our Facebook page. There are a lot more of us around! Great Statement. A shame that Jews for Jeremy is only on Facebook: no good for those of us who don’t/won’t use social media. Surely it could also quickly be set up as a website – or even petition? Whoops! Bit slow on the uptake – have just discovered that jewsforjeremy.org already exists. That’s OK, Susan, though I’m a bit confused as to how you posted on the website to say there should be a website. Maybe you thought you were posting on a Facebook page. All the best, Ian. I keep trying to reply & it keeps disappearing into the ether, so third time lucky to say that I came across ‘Jews for Jeremy’ in this morning’s posting from JfJfP (I tried to copy the JfJfP link for you twice but each time lost what I’d already written) – ‘Jeremy Corbyn – antisemitic by association’, and clicked on the ‘Jews for Jeremy’ link in that report which took me to ‘Jews for Jeremy Statement’ and being able to make my initial comment at 11.40am; by 12.16 i.e. 36 mins later, I’d realised that my comment was on the website I was asking for, which was why I made the 2nd comment, confessing to my idiocy! That’s fine, Susan. Glad you found us in the end. POLITICAL campaigners within the Jewish community who back “socialism and progressive values” have launched a campaign group to support Jeremy Corbyn’s labour leadership bid. Corbyn has been subject to insinuations of antisemitism from the pro-Tory Jewish Chronicle due to his support for justice in Palestine. Now campaign group ‘Jews for Jeremy’ [Jews for Jeremy] has organised pro-peace campaigners from within the Jewish community who support a diplomatic approach to foreign policy and social justice at home. 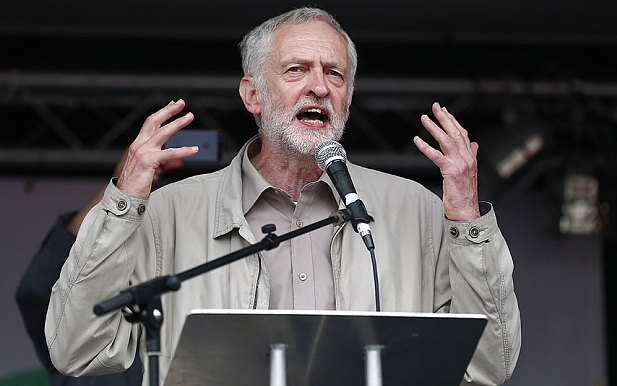 A statement released by the group, which was founded by campaigner Ian Saville, said: “In international relations, the group asserts that Jeremy Corbyn’s policies offer the best hope for peaceful resolution of conflicts both in the Middle East and the rest of the world. Corbyn has been criticised for previously holding meetings in parliament with representatives from Hamas and Hezbollah. Although Corbyn does not support the groups, he says political engagement is required as part of a wider peace process. I’m for you guys. Thank you for your savvy and courage. We can create a better world by not allowing ourselves to set borders between race, belief, tribe, class. It is clear to me that Çorbyn represents the best in us, the love for human beings and the steadfast refusal to allow the misinterpretation of religion, false doctrines and education, and supremacist ideology to separate us from one another. What do you make of the current crop of smears against Jeremy and his Labour Party MPs? Thanks to everyone here for standing up against this concerted campaign which seems to unite the right wing in the PLP and the Tory front bench – just at a time when the Government is on the ropes the Blairites want to throw them a lifeline just to try and get rid of Jeremy. It won’t wash.
I’m not a labour supporter, but I believe that Jeremy comes from a good place and is a principled man, certainly not an anti semite. Support for Israel some 48/49 years ago was strong, it has just lost it’s way, fairness has been thrown out of the window, this behaviour has given a window of opportunity, for anti semitism to get it’s foot in the door, slam the door shut. Jeremy is of an age where he can control his ego and nurture and grow idea’s many of us have had since the 70’s hopefully we can see these ideas come to fruition. He has to be careful who he surrounds himself with. Delighted to see this, especially as a person of entirely Jewish origin on my mother’s side. Thank you. Its so good to see the good-hearted people from jewish community come out and speak to dispel the conveniently used anti-semitic allegation. Facts needed to be treated as facts and not distorted to protect the wrongful policies when it comes to any country. I do wish though that Mr. Corbyn showed a bit more support to his respected party members in dispute in question. Its easy to see they were both of anti-Israel opinion and had no ill feelings towards Jewish people. Why does Charlie Hebdo get all the support it gets in our parliament and not these two MPs for exercising their free speech? Love to Jewish, Christian and Muslim readers.Peace!